IRVINE, Calif. — Virtual reality is one of many inventions that never seemed to make the leap from science fiction to mass-market product. Again and again, headsets that promised to immerse people in wondrous, three-dimensional worlds have bombed with the public — held back by high prices, ungainly designs and crude graphics. But now the bonanza of cheap, high-quality components created for the mobile electronics market, coupled with some technology innovations by a Southern California start-up called Oculus VR, could bring within reach the fantasy of many a video gamer: a virtual reality headset that costs just a few hundred dollars and puts players inside games like no television set can. Resembling an intimidating pair of ski goggles, the Oculus Rift, as the headset is called, envelopes the vision of people who wear it in vivid, three-dimensional images. The sensation is like watching an IMAX screen that never ends. A snap of the head to the left instantly shifts the perspective inside the game in the same direction. That connection between a player’s point of view in the game and the real world makes the experience feel more natural when, say, the game character is surrounded by a group of armored knights. The company’s design, which is about to be delivered to game developers, is already creating buzz among industry veterans and battle-scarred believers in virtual reality. Despite its missteps in the consumer market, virtual reality has become commonplace for a number of industrial and military applications, where the high cost of headsets — from $1,000 to $50,000 — has been less of an impediment. Hospitals use the headsets to train surgeons, while the United States Army has used virtual reality to treat post-traumatic stress disorder, in part by exposing soldiers to short simulations of combat. The mass market has been far more elusive, in large part because the components in the headsets were too costly. Many of the crucial parts in the Oculus Rift are the same components found inside smartphones and tablets, including the headset’s 7-inch display and its sensors for detecting head movements. Because those parts are already being pumped out in enormous volumes in factories in China, Oculus can create a product that is likely to end up costing consumers something between $200 to $300. “I’ve said this before, so you can’t totally trust me on this, but really, really I believe this is the time,” said Mark Bolas, an associate professor at the University of Southern California and a longtime virtual researcher who is an adviser to Oculus VR. Elements of the Oculus headset are based on the virtual reality research by U.S.C., which has freely released headset designs for others to use. Still, most venture capitalists would rather finance a hot-dog stand than a high-risk virtual reality start-up. Oculus instead used the crowdfunding site Kickstarter to harness the enthusiasm of virtual reality fans and to take orders so it would not produce too many headsets. It raised $2.4 million on Kickstarter and received orders for 10,000 headsets. The first ones, which Oculus says will begin shipping next month, are still rough around the edges and are primarily aimed at game developers. Oculus is mum on when it will ship a version for consumers, hinting that its target is next year. If the company is successful, it will have a lot to do with Palmer Luckey, the 20-year-old founder of the company, who seems to have wandered out of a casting call for unconventional, young technology entrepreneurs. He pads around his office in bare feet, munching on cookies. He refuses a chair during a meeting, preferring to sit cross-legged on the floor. Mr. Luckey was a home-schooled teenager living with his parents in Long Beach, Calif., when he began collecting virtual reality headsets, a habit he financed by fixing broken iPhones and Nintendo DS’s in his garage and reselling them at a profit. Mr. Luckey estimates he spent $32,000 on headsets in one year alone, about 45 of which he now has in his collection. While he was passionate about virtual reality, Mr. Luckey realized that none of the headsets he bought offered the kind of immersive experience he wanted from the technology. He began tinkering with headset designs of his own. Last summer, he paid a visit to Mr. Bolas at U.S.C., who hired him on the spot to help out with virtual reality projects at the university’s mixed reality lab, a research group financed largely by the Defense Department. 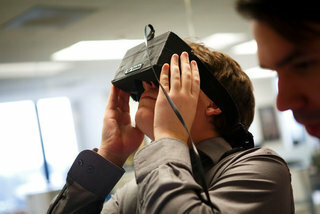 “If there had been a perfect headset, I wouldn’t have gotten into virtual reality,” Mr. Luckey said. Mr. Luckey’s biggest break came when he struck up an online conversation last year with John Carmack, the game programmer behind Doom and Quake. He sent a prototype of the Oculus Rift, which used Oakley ski goggle straps and was held together by silver duct tape, to Mr. Carmack, who took it to the E3 games conference and used it to demonstrate one of his games to a small group of attendees. People who put the headset on were amazed by how the game world surrounded them. It has a 110-degree field of view, far more expansive than the 40 degrees of many virtual reality headsets. Brendan Iribe, a game industry veteran who formed Oculus with Mr. Luckey and others, said he was initially skeptical when a mutual friend had told him Mr. Luckey was working on virtual reality, but his perspective quickly changed after he saw how the technology made the boundaries of conventional screens melt away. There are still big obstacles that could send Oculus Rift to the graveyard of failed virtual reality headsets. The company has not announced commitments from game developers to create complete games that work on the headset, though Oculus said that will change at a game developer conference next month. Tim Sweeney, the founder of Epic Games, said his company was working on plans to support the headset in its games. The headset is currently designed to work with computer games, not with the popular consoles made by the likes of Sony and Microsoft. Oculus says existing computer games can be adapted for virtual reality without great expense. But some analysts are skeptical that consumers will be excited about buying a game headset, even if developers like it. “There’s no real appetite to wear a peripheral,” said Michael Pachter, an analyst at Wedbush Securities. Virtual reality headsets can also cause motion sickness in people who wear them, though the effects vary by person. Oculus is doing everything it can to reduce the latency, or delay, in its headset between head movement by players and changes in on-screen perspective, which is one cause of motion sickness.